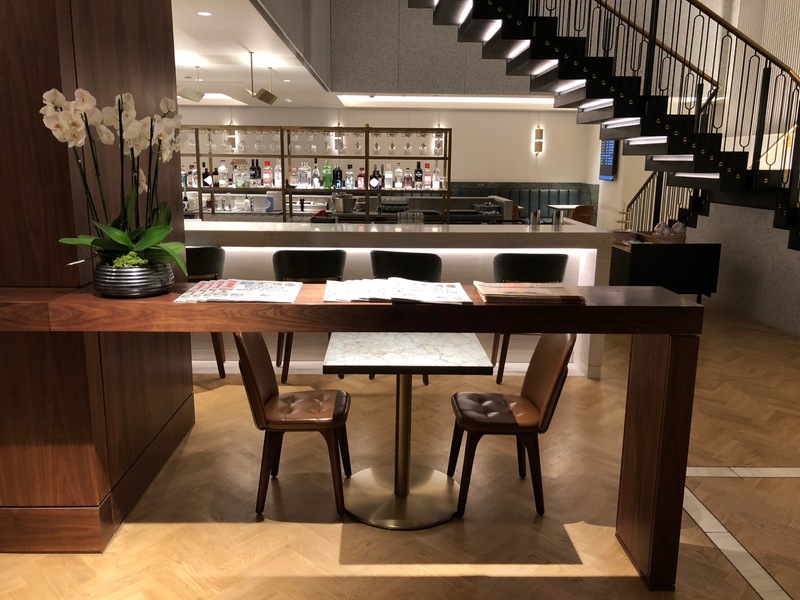 The Qantas Lounge in London Heathrow Terminal 3 is an ideal alternative to the nearby British Airways Lounge. Business class passengers on oneworld as well as oneworld frequent flyers (Emerald or Sapphire status) have access to this exceptional lounge, open daily from 7:55 AM to 8:35 PM. The two-level lounge offers a restaurant-style dining area and bar on the ground floor and plenty of seating, showers, another bar, and buffet upstairs. Seats are comfortable and power ports are plentiful. I had just arrived from Los Angeles and was happy to take a shower in the lounge before my connection. Showers are self-serve here. You find an open shower suite, help yourself to a towel, take your shower, then deposit your towel back. Each shower suite contains a toilet as well as a sink and spacious shower. Separate restrooms nearby also offer private rooms rather than shared facilities. The highlight of my stay in the lounge was a couple of phenomenal barista-made cappuccinos. Qantas has nice coffee machines both upstairs and downstairs with great quality coffee. I enjoyed a cappuccino as I entered and another one as I departed…what a pleasure. Qantas offers a la carte dining in its downstairs restaurant area before its Perth and Singapore flights. When I was there (late morning), there was no a la carte dining offered, though a small buffet had been set up and the bar was open. A full buffet was offered upstairs with a nice selection of breakfast options including all the components of an English breakfast, fresh fruit, cereals, bread, and baked potatoes. Two miscellaneous notes. First, wi-fi is lightning fast in this lounge. Second, newspapers and magazines are available in different areas on both floors of the lounge. I was so impressed with this lounge I just parked myself here to work. Next time, I’ll check out the American Airlines and Cathay Pacific lounges as well. To me, Wi-Fi and coffee are the two most important aspects of any airport lounge and the Qantas lounge excels in both areas. If you are ever wondering whether you should choose this lounge or the nearby British Airways lounge, choose this one. For more technical info about the lounge, see this earlier post. Nice to know although I love the Cathay lounge so hard to skip that. It’s always empty before flights to the USA in the morning and has great made to order dumplings and a great view of the tarmac. I’m always torn these days between the Qantas lounge and the Cathay one. They are different but both excellent. Sadly I rarely have sufficient time to do both. I have not yet spent time in the refurbished Cathay Pacific lounge, only the old one.